« Tisbury Bronze Age Hoard Goes on Show at Salisbury Museum . 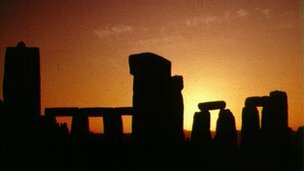 Two previously undiscovered pits have been found at Stonehenge which point to it once being used as a place of sun worship before the stones were erected. 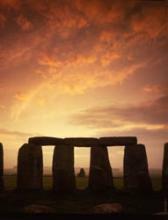 An international archaeological survey team found the pits as part of the Stonehenge Hidden Landscapes Project. The team is using geophysical imaging techniques to investigate the site. The archaeologists from the University of Birmingham and the Ludwig Boltzmann Institute for Archaeological Prospection in Vienna have been surveying the subsurface at the landmark since summer 2010. It is thought the pits, positioned within the Neolithic Cursus pathway, could have formed a procession route for ancient rituals celebrating the sun moving across the sky at the midsummer solstice. A Cursus comprises two parallel linear ditches with banks either side closed off at the end. Also discovered was a gap in the northern side of the Cursus, which may have been an entrance and exit point for processions taking place within the pathway. These discoveries hint that the site was already being used as an ancient centre of ritual prior to the stones being erected more than 5,000 years ago, the team said.